Are your elderly loved ones currently taking prescribed medications? Are you certain they’re taking them exactly as prescribed? Research shows that the typical senior is taking a multitude of prescription meds – as many as 15 – 18 of them each and every day. And, as many as 55% of those prescription medications are not being taken correctly for a variety of reasons, with serious repercussions. 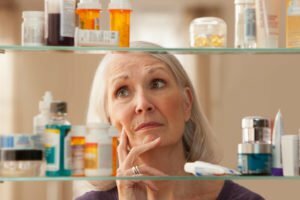 Knowing as much as possible about your own prescriptions and those your older loved ones are taking can help eliminate the potential for dangerous medication mishaps and allow for the optimum benefits of the medications. Below are several tips to help ensure proper medication adherence. It’s also crucial to keep a close eye on your elderly loved ones whenever they begin taking new prescriptions for possible issues, and to communicate with the prescribing doctor in the event that any unwanted effects are experienced, rather than stopping the medication. The doctor can help you and your senior loved one consider the benefits vs. the risks of the medication, talk about any alternate options, and help determine the best treatment plan. Never modify pills without the doctor’s consent. Some drugs are designed to release medication slowly over an extended period of time, so crushing or breaking them in half could destroy the time-release aspect of the medication, causing the senior to receive too much at once or none at all. If swallowing pills is difficult for the senior, ask his or her doctor or pharmacist how or if a tablet can be modified or if it is available in a smaller pill or liquid form. Seek out additional support. Partnering with a professional in-home caregiver, such as the Tri Valley home care experts at Hired Hands Homecare, can mean the difference between serious medication mistakes and healthy seniors. A caregiver can make sure that medications are always taken exactly when and as prescribed, pick up medications from the pharmacy, take note of any negative effects and report them immediately to the doctor and the senior’s family, and more. The services of an in-home caregiver are even more beneficial when family lives at a distance from the older adult, or because of time constraints, are unable to be with the senior as often as needed. Ensuring proper medication adherence for an older loved one can be challenging, particularly when the senior has multiple prescriptions to manage. Hired Hands Homecare’s caregivers are standing by to assist in keeping your senior loved one safe. Contact us at (866) 940-4343 to learn more.